She made a trail mix snack with 100 pieces of goldfish, popcorn, fruit loops, m&ms, pretzels, cheerios, & crackers. counts up to 100 by 10s. And each student was asked to bring a collection of 100 things to school with them & guess what Addy brought, 100 letters of course! 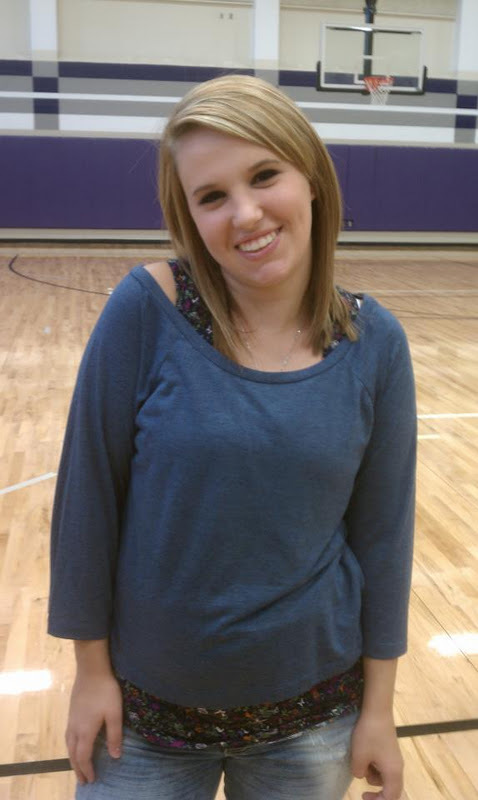 Yesterday was also school picture day. 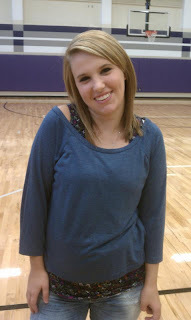 Mrs. Barry told me that Addy sat on Mrs. Cochran's lap during the class picture. (I'm really not surprised, that's how much they love her at school!) And Mrs. Barry also said that Addy cooperated while taking her individual picture (which is great because as you can tell, she didn't cooperate when I was taking her picture after school) & that it turned out really cute! I can't wait to see them! Here's a yummy recipe for you that's super quick & easy! 1. Place one pie crust in the bottom of a round pie pan. 2. Mix chicken, soup, vegetables, cheese & seasonings. Pour into pie crust. You will probably have some left over. Maybe even enough for a second pot pie. 3. Place the 2nd pie crust over the top. Press the edges together with a fork. Cut a slit in the top to vent. 4. Bake at 350 degrees for 45 minutes or until crust is nice & brown. Last Saturday Nick, Keith & I ran the 10th annual Rockets Run. The run raised over $10,000 for Autism Speaks! How awesome is that!!! I 'm pretty competitive & this was my biggest race to date, with over 2100 people, so I was feeling sick on the way there. (The mere thought of losing makes me physically nauseous.) But I surprised myself & ended up doing really good & beat my best time by quite a bit. I finished in 21:08 & won 3rd place in my age range for females & 148th overall. I got a bronze medal & got to take a picture with Clyde Drexler (who I beat in the run by the way.) Nick also did great. He finished in 24:09 which is his best time to date. He was 28th in his age range & 380th overall. Unfortunately, Keith put his timer on upside down so his time was not tracked. I got my laptop back, yay! I'm super excited because it's like a brand new laptop. It actually works better than it did when it was brand new. I'm pretty sure our computer was a lemon when we bought it. But now that the hard drive and the wireless antenna have been replaced and the charger has been fixed, it works great! I've been keeping up with my resolutions. Cooking & working out 5 times a week & drinking 8 glasses of water a day. I didn't keep with the first 17 days of dieting, but that wasn't my resolution. My resolution was to maintain my weight & I am doing that, I'm just not doing it on the 17 Day Diet. I've been working out consistently & have actually worked out 19 of the 20 days this year! I even ran my fastest mile last week, 6 minutes & 51 seconds! I'm super excited about that! And Nick & I will be running our 1st 5K of the year tomorrow. 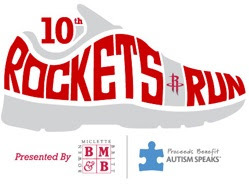 We're running in the Rockets Run that benefits Autism Speaks. We'll run through downtown Houston & cross the finish line on the floor of the Toyota Center where the Houston Rockets play. Sounds like it's going to be a lot of fun! Addy had a reevaluation in OT. The test is standarizied & because of that Addy scored low in some areas. She can do certain skills, but just doesn't do them the "standarizied" way. But that's actually a good thing, because it justifies her going to OT & makes it where the insurance will still pay for it. She is doing so good that her therapist said that she doesn't really need to come anymore. But she enjoys OT & will still be going to speech therapy so we're going to keep her in OT. We're just going to drop her to one time a week instead of 2. Nick & I are so proud of our sweet little Addy girl! She is making so much progress. Maryse's looking for a job. She's filled out one paper application & one online application so far. She doesn't want a fast food job & a lot of the places she went by only hire 18+ years old. She applied to be a cashier at a pizza place that's here in Sienna & we're hoping that she'll get that job. Seems like it would be pretty easy & fun for her. She also emailed a few moms that posted ads on Siennanet (like southeasttexas.com for sienna residents) looking for babysitters. So we'll see if any of that pans out. On Monday, I took Maryse to the doctor for her headaches. She has gotten them on & off since she was in 3rd grade. We tried allergy testing but that didn't seem to be the problem. So this time I took her to the pediatrician. Based on what Maryse told the doctor & the fact that Nick got migraines as a child & teenager, Maryse was diagnosed with migraines. The doctor put her on a low dose of blood pressure medicine which should "break the cycle" of the migraines. This medicine is supposed to be pretty safe & if she starts to be headache free, she can choose to quit taking the medicine & then start back up as needed. I'm really glad that we got a diagnosis for her & really hope that this medicine works. On a sad note, we had to get rid of Pepper. Alex hit her with a toy hammer & she jumped up & bit him in the face :( She punctured his left cheek & bit around his right eye. I was sad to get rid of her but we just had to. There's no way we could keep her after that. Luckily, Roger took her to his mom. Hopefully she'll be a good dog for her since she doesn't have any little kids. She was a good dog with adults, but she just couldn't handle all the excitment of the kids. Nick & I went on our January date night. If you'll remember, January was dinner & a movie, Nick picks & he gets no objections from me. So we ate dinner at Pappasitos & then went to Ben & Jerry's to get some ice cream! And the movie that he picked was The Girl With the Dragon Tattoo. I was a little unsure about the movie because the previews didn't look very good. But I did not object & I ended up loving it! It was definitely graphic in some parts but overall it was a great movie. And now I want to read the books. We had a really good time hanging out together. And when we got home, Maryse had gotten both the kids to sleep & was asleep herself! We bought the kids a new swing set, a nice big wooden one. I have been considering buying one for a long time but just didn't want to spend the money. I was looking online last week for one & found this one for 50% off at Toys R Us. It was such a good price that I had to go ahead & buy it now, even though it's January & not really playing outside weather. Nick's parents came over for the weekend so that his dad could help him put it together. And of course, Alex wanted to help. He got all his play tools together, put on his hard hat & was a great big help! They worked on it Sunday & finished up on Monday. The kids absolutlely love it! Probably one of my best purchases ever! The kids are too little to do the monkey bars right now so Nick took a few of the trim pieces & closed off the entrance to them. Of course the boxes that the playset came in were a giant success too! to get my laptop fixed AGAIN!!! We haven't even had this computer a year & I'm sending it off tomorrow for the second time for repairs. Arrggg! So until I get it back I will be on a blog vacation. Hopefully I'll have lots to tell you when I return! so this year my New Year's Resolutions for 2012 reflect that. I feel like if I have them on record here, it'll be harder for me to break them! Nick & I decided to start to the new year off right by going back on the 17 Day Diet to shed those few extra holiday pounds. One of my major downfalls when I try to get healthy is not wanting to prepare a meal. So Sunday, I went to the grocery store & bought about 25 lbs of chicken breast. I trimmed all the fat off the chicken & then I put 3 breasts in a freezer ziploc bag & dumped a bottle of bbq sauce or marinade on top. I had enough chicken for 12 bags! So I have 12 of our first 17 days already taken care of! Each morning, I'm taking a bag of chicken out of the freezer, defrosting it & it's ready to throw in the oven or on the grill in the evening. The other 5 days we'll probably have fish (like we did last night.) Today is Day 4 & I've already lost those 3 lbs I had gained over Christmas! I really don't want to lose any additional weight so I'm only going to do the first 17 days as sort of a cleanser & then I'll go back to maintaining. As most couples do, Nick & I get caught up in work, the kids, cooking & cleaning & everything else that goes along with being a family & sometimes find that we hardly see or speak to each other throughout the day. So that's why I made a resolution to spend more time together. I saw something on Pinterest that I thought was really cool. A wife made up an envelope for each month of the year & inside it held a little note that told what her & her husband would do on a date that month. I loved this idea so I made it for Nick & I for 2012. I made a list of ideas & wrote down something for each month. And then Addy decorated the envelopes for me. For January, she drew a cake, party hats & balloons for a New Year's party. Running a 10K & a mud run should be no problem! The other resolutions, I'm afraid, might be a little harder to keep long term though. Working out & cooking 5 times a week, am I crazy? And 8 glasses of water EVERY day??? Well, I'm definitley going to try! I ordered a whiteboard calendar for my kitchen. I'm going to tally my cooking & working out for the week & my water every day on it. What I've been doing is drinking 2 bottles of water (which equals 4 glasses) before lunch & then I let myself have a diet dr pepper with lunch. Then I have the rest of the day to finish the other 2 water bottles. Four days in & I've drank all my water each day! So there you have it... My resolutions to live a healthier 2012! What about you, what are some of your resolutions? Leave me a comment & let me know & maybe we can encourage each other to keep them! Last night was New Year's Eve! We went to our good friends house to celebrate! Addy had mac & cheese of course! But guess what we didn't do? Make it til midnight! Alex was tired & ready to go home around 10:30 & he was asleep in less than 7 minutes (or one episode of Pocoyo) after getting home & Addy wasn't far behind him!